Enjoy Anna Mason Art Classes offline on Mac, Windows and Any Media Devices. Download classes from Annamasonart.com to MP4, AVI for playback on Mac, Windows, iPhone, iPad, Android phone or tablet. Annamasonart.com aims to offer Anna Mason's watercolor classes, tutorials, tips, etc. These online art classes are only for streaming, not downloading, so you will have to keep good internet connection to concentrate to study. However, sometimes you may want to download classes for viewing anytime and anywhere especially at the place without Internet Connection. Then you may need an Online Art Classes Downloader. Among so many video downloaders, Bigasoft Video Downloader Pro is highly recommended for its fast speed and powerful features. Bigasoft Video Downloader Pro enables the users to download their watercolor classes from Annamasonart.com to computer (Windows and Mac), Mobile phone, iPhone, iPad, Android or Windows tablets, etc. Moreover, almost all the popular websites are supported, including YouTube, Udemy, Lynda, Craftsy.com, Adobe TV, Discovery, Livestream, Pluralsight, etc. Apart from that, Bigasoft Video Downloader Pro also works as a powerful video converter, video clip editor, video recorder, etc. How to download Anna Mason Art Classes from Annamasonart.com? 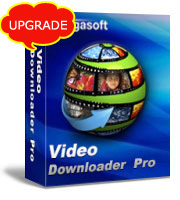 Firstly, download and install this professional video downloader - Bigasoft Video Downloader Pro. There are two different versions for Windows and Mac users separately. And the two versions are fully compatible with the latest OS. Just follow the steps, you will be able to enjoy watercolor classes from Annamasonart.com anywhere and anytime. Go to Annamasonart.com and copy the URL of your class which you want to download. Then paste it to the URL box on the main download panel of Bigasoft Video Downloader Pro. Generally, the link address will be automatically pasted to the URL box. Multiple URLs can be pasted at the same time, so the art classes from Annamasonart.com can be downloaded in batch. Click "Save Folder" button to choose the destination folder for the downloaded Anna Mason's art classes. Usually, Bigasoft Video Downloader Pro downloads videos in its original format. If you prefer to viewing them on media devices like iPad, iPhone, Android or Windows phones and tablets, simply tick "Automatically Convert to" and then choose your desired video or audio format from the drop-down menu. One-click to download Annamasonart.com videos. From Activity panel, you can check the downloading process. After a few minutes, the Anna Mason's art classes will be downloaded and converted to destination path. Now with this all-in-one Bigasoft Video Downloader Pro, free of ads and plugs, you can download the art classes and concentrate to study at any place on any devices. Download Bigasoft Video Downloader and have a brand-new online classes downloading experience.